Multiple Astrobites over the years have focused on papers exploring the mysterious origin of IceCube’s astrophysical neutrinos. The first detection of astrophysical neutrinos in 2013 inspired significant effort towards identifying their progenitors. To aid in the rapid multi-messenger followup of their highest energy neutrinos, a real-time alert program was set up to immediately notify the community and allow astronomers around the world to possibly identify the sources of these neutrinos. 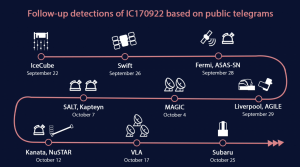 As of September 2017, nine such real-time alerts had been distributed to the general astrophysical community; none resulted in the detection of an electromagnetic counterpart. That was until September 22, 2017, when a high energy astrophysical neutrino (IC170922) zipped through the cold Antarctic ice. However, unlike the many millions of its brethren who zoomed right on through and out the other side of the Earth, continuing their journey through space, this neutrino collided with an atomic nucleus deep in the ice near the IceCube Neutrino Observatory located at the South Pole. This interaction produced a secondary charged particle, a muon, that sped through the IceCube detector. As the muon moved through the instrumented ice, it created a cone of Cherenkov radiation (blue light), produced when a particle moves through a medium faster than the speed of light in that medium — the electromagnetic analog to a shock wave. 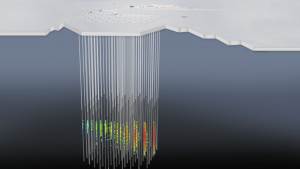 The Cherenkov radiation triggered the IceCube detector’s grid of photo-multiplier tubes and initiated a low-latency analysis running at the South Pole, finding the signal to be characteristic of a muon neutrino. Since Cherenkov light traces the path of the muon, and the muon follows a trajectory similar to the parent neutrino, the neutrino’s origin was able to be localized to an approximate 1 square degree patch of the Southern sky based on when the different detectors sensed the signal. Within 43 seconds of the neutrino’s detection in the Antarctic ice, preliminary data containing initial estimates of the energy and direction of the neutrino event were telemetered from the South Pole and distributed to astrophysical observatories around the world and in orbit, through the Astrophysical Multi-Messenger Observatory Network (AMON) and the Gamma-Ray Coordinates Network (GCN). This triggered a host of observations; the timeline of detection reports from the telescopes involved is shown in Figure 2 below. The IceCube alert triggered an automated response from NASA’s orbiting Neil Gehrels Swift Observatory. In a rapid-response mosaic tiling of the IceCube error region the X-ray Telescope (XRT) onboard Swift identified 9 X-ray sources consistent with the localization of IC170922, one of which was the blazar TXS 0506+056. A blazar is a super-massive black hole embedded in the center of a galaxy that is powered by material falling onto the black hole, which creates an accretion disk. Relativistic jets of high-energy radiation and particles are expelled from the system at the poles; for TXS 0506+056 one of its jets is pointed approximately towards us. In the following days this blazar was found to be in an active flaring state by gamma-ray observatories on the ground and in space. The Large Area Telescope (LAT) onboard the NASA Fermi Gamma-Ray Space Telescope (Fermi-LAT) which performs an all-sky survey in gamma-rays every day, found in recent archival data that TXS 0506+056 had brightened by a factor of ~6 in gamma-rays in the days leading up to September 22. Further observations spanning the electromagnetic spectrum from gamma-rays to radio confirmed that the blazar, living in a giant elliptical galaxy approximately 4 billion light years away, was in a flaring state. Markedly the Major Atmospheric Gamma Imaging Cherenkov Telescope (MAGIC) located in the Canary Islands, followed up and on October 4 detected even higher energy gamma-rays coming from the same direction as the neutrino and TXS 0506+056, the first detection of its kind. All of these observations pointed to the conclusion that TXS 0506+056 is one of the most luminous and energetic sources in the universe, and thus would have the energy necessary to create and accelerate extremely high energy neutrinos. Futhermore, during late September and early October 2017, TXS 0506+056 was going through an intense flaring period, producing extremely high energy gamma-rays that may come directly from the very same physical processes that produced these neutrinos. But don’t jump for joy just yet. While all of this evidence compellingly points to the blazar TXS 0506+056 as the source of IC170922, it does not indicate a multi-messenger detection was made. Wait, what? Why not? Well, blazars blaze, it’s what they do. So the relevant question is not only ‘how energetic was this blazar and could it have produced IC170922?’ but also ‘what is the chance of a positionally coincident EHE neutrino and flaring blazar happening at random?’ i.e. what is the probability that TXS 0506+056’s flare and IC170922 are actually unrelated?. The paper claims that a chance coincidence of the neutrino with the blazar’s flare is disfavored at the 3-sigma level in any model where neutrino production is linearly correlated with gamma-ray activity. That is, only 0.3% of the time would one expect to see such a coincidence. While certainly compelling, 3-sigma does not quite reach the bar that most astrophysicists would consider necessary to claim TXS 0506+056 as the electromagnetic counterpart to IC170922. Further observations of flaring blazars coincident with high-energy neutrinos are necessary to unambiguously establish a connection between these phenomena, and to understand the mechanisms of neutrino emission and acceleration in this setting. Astronomers all over the world will be waiting for the next high-energy neutrino alerts and will be keeping a close eye on flaring blazars, but even if blazars are found to produce some of IceCube’s high energy neutrinos it won’t be the end of the story! A previous study comparing Fermi-LAT’s observations of the gamma-ray blazar population with IceCube’s high energy neutrinos found that these blazars can produce only a portion of the astrophysical neutrino flux above 10 TeV, meaning there must be other powerful cosmic particle accelerators lurking out there in the universe. There are certainly more important multi-messenger observations on the horizon, and hopefully the future continues to be neutrino bright! Disclaimer: The author of this Astrobite is a coauthor on this and other papers related to IC170922 and the associated flaring blazar TXS 0506+056. I am a member of the Science Operations Team for the NASA Swift Observatory. I work on telescope + spacecraft operations and my research focuses on GRBs, electromagnetic counterparts to gravitational wave and neutrino events, and indirect dark matter detection.